If it started raining today, how much would we need to end this drought? Texas is suffering from an historic drought and one question that looms large is – how much rain will we need to actually end the drought? And the answer is – A LOT! 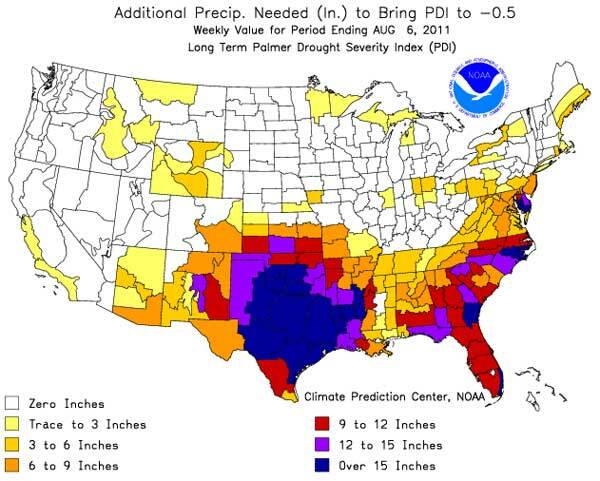 The National Oceanic and Atmospheric Administration (NOAA) indicates 12 to 15+ inches of rain (shades of purple and dark blue) is necessary for most of Texas to end the drought, as shown in the graphic below. Even those small parts of the state not needing those massive amounts of rainfall to end this drought will require six to twelve inches of rain to recover. With the Climate Prediction Center now saying there is a 50/50 chance of a return to La Nina conditions this fall which almost always results in drier than normal conditions for Texas and most of the South, the potential for recovery any time soon is pretty slim. It has taken months for the drought to get to the level it is at now and it will take months or even years to return to normal. But all indications are that there is no major relief coming soon and if you haven’t already done so, consider taking measures to reduce your water and electricity use for the long haul. For ideas on how consumers can do this, check out the Texas Is Hot website for tips on how to reduce your energy use, and TCEQ’s Take Care of Texas website for tips on conserving water.